The St. Andrew’s Cottage, a year-round early learning program of St. Andrew’s Episcopal School, exists to offer a quality learning experience to young children from families in the greater New Orleans area without regard to race, religion, gender, or ethnic origin for admission. The mission of our larger school community is as follows: St. Andrew’s Episcopal School strives to educate the mind, body and spirit of children by promoting academic excellence and social responsibility in a small, nurturing environment that values faith, reason, and diversity. To that end, St. Andrew’s Cottage is designed to nurture the development of all children in attendance. The curriculum is child-driven and reflects scholarly literature regarding early childhood enrichment and mental health. Our goal for each participating child is two-fold: to fulfill his/her potential for intellectual, social, and emotional functioning; and to be prepared to succeed in school and in life. Our 12 month early childhood program serves children 18 months to 3 years of age. The program is open Monday – Friday, 7:30 am to 6:00 pm. Nutritious meals and snacks are included in the cost of tuition. Our program is designed to support the total development of young children through high-quality interactions. Through intentionally planned activities and learning center experiences, teachers facilitate the development of cognitive, expressive and receptive communication skills, as well as fine and large motor skills. In full realization that children learn as much from their interactions with each other, social interaction, indoor and outdoor play, and small group experiences are a valued part of our curriculum. Parents will receive regular feedback on their child’s interests, friendships, growth and progress and are asked to share information that supports our knowledge of and service to the children in our care. The faculty of the Cottage view ourselves as partners and collaborators with parents in creating a dynamic and responsive program for children. Our teachers develop weekly lesson plans that support children’s growth in all domains. Teaching Strategies’ Objectives for Development and Learning guide our planning, teaching and response. To build social-emotional development, teachers use strategies and activities from the Center on Social Emotional Foundations for Early Learning. We also use a story telling/story acting curriculum for literacy development with our three year olds. Twice a year, teachers meet with parents to discuss the child’s development in communication, gross and fine motor skills, personal-social skills, and problem solving. Together, parents, teachers, and leadership set age-appropriate goals that support the child’s learning with love, compassion, and patience. St. Andrew’s Cottage enrolls students 18 months – 3 years old through our waiting pool. Parents who wish to enroll their children in St. Andrew’s Cottage must complete the on-line waiting pool form: St. Andrew’s Cottage Waiting Pool Form. As soon as a spot becomes available we will contact you. 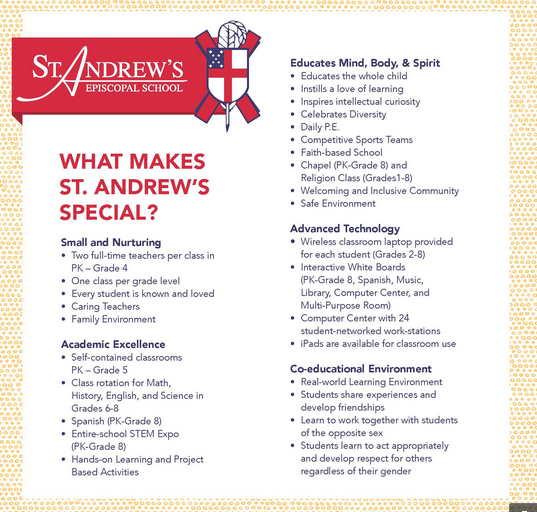 Want your child to continue at St. Andrew’s Episcopal School for Pre-Kindergarten – 8th Grade parents must formally apply and follow admissions procedures.